Since 1966, Schwinn proves one of the top leading positions in fitness marketplace. It offers a variety of popular Schwinn stationary bikes such as recumbent, traditional upright, spin and Air dyne series of fan-based upright exercise bikes. 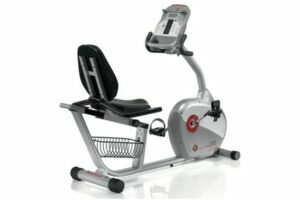 You will see lots of Schwinn exercise bike appearing in gym rooms or popular advertisements. Schwinn exercise bikes are well-known because of the great combination of ergonomic design, high-quality materials, and solid construction. Therefore, they deliver different ways to get better fitness program at home. This bike is the latest version of Schwinn recumbent bike which contains many advances to promote a healthy and active lifestyle for all customers. The most novation you can find in this Schwinn is on the display. This bike has a totally easy-to-navigate console. It is designed oversize and allows you to track your fitness easier. The dual LCD window system helps you monitor your training with 13 display feedbacks. So you can take them as the suggestion. It comprises of 29 different built-in workout programs with 12 courses and 4 settings for users. All of them support you much on self-motivated and challenge yourself to have a better health. Moreover, you can connect it to Bluetooth. It offers the seamless data’s transition so as to support your smart devices such as phone or iPod. The resistance can be found at 25 different levels which are controlled by your computer. So you will have much more options for your effective workout. In addition, the convenience is also its priority, too. The backrest is improved to support your lower back. Then the seat is equipped with pad and a contoured leg to bring you the most comfortable feeling during your workout. Besides, it has a slide rail system for your seat as well. This feature helps you to control your position as convenient as you want at any time of training. And the built-in transport wheels allow you to move the bike easier. More so, it provides a USB charging port, a cooling fan with 3 different speeds, a media rack and the useful handlebars which allow you to monitor your heart rate accurately. + LCD screen system allows you to control your program and track it effectively. It provides 29 built-in workout programs, 12 courses, and 4 users’ settings. They help you so much to promote your training progress. + Compatible Bluetooth: allows you to connect with your smart devices. + Multi-level resistance: there are totally 25 one for you to control and play as your options in doing the workout. + Adjustable padded seat: it can slide along the rail and you can take advantage of it to feel easier during the whole training. + Heart rate control: your heart rate can be monitored easily by the handlebars. + The bottle holder is placed on the left side of your bike, so it seems a little bit inconvenient for someone who not very good at left hand. 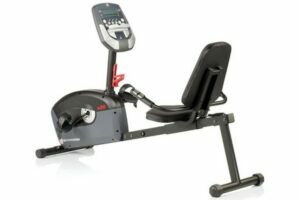 This Schwinn 270 Recumbent Bike (MY17) can be considered as one of the best recumbent exercise bikes you should take. It allows you to train in the best condition and convenience. This bike has two LCD screen system allows you to get your information easier. It shows you your track time, calories goal and distance, also transfer metrics accurately. And the metrics can be transferred via USB. It helps you control your stats effectively. Moreover, the control resistance has 25 levels for you. Then you can be able to access the best one for your training. Besides, there are 22 pre-set exercise programs included. They are comprised of 8 heart rate control, 9 profiles, 2 custom users defined, fitness test, quick start, and some other features. This allows you to finish your training course effectively. And in addition, there would be USB port, chamber speakers, cooling fan with 3 speeds and a shelf for media stuff. All of them help you experience your workout in the most convenient way. The pedals are also equipped with straps to keep your feet in place and avoid slipping. And the backrest will support your lower back with its special structure. The seat is equipped with a slip rail system so you can slide it as you want at any time during your workout. + 22 pre-set programs: they contain heart rate control, profiles and many other added features to help you follow usefully and effectively. + Other conveniences: it provides a USB port, cooling fan, and a shelf for placing your media stuff. All of them are made to comfort you much. + Pedals: they are designed with straps, so you can cycle easily and not afraid of slipping or your feet can be in the wrong place sometimes. + The seat is not padded: it will make you uncomfortable sometimes. This Schwinn 230 Recumbent Bike (2016) is highly appreciated for its awesome features. It offers you many conveniences to experience your own work-out and give you the best body soon or later. Are you just an entry-level exerciser? Have your goals to lose some weights? You want to increase your physical activity level or simply maintain the shape that you are proud of? You want equipment that would become one of the best investments you have made eventually? 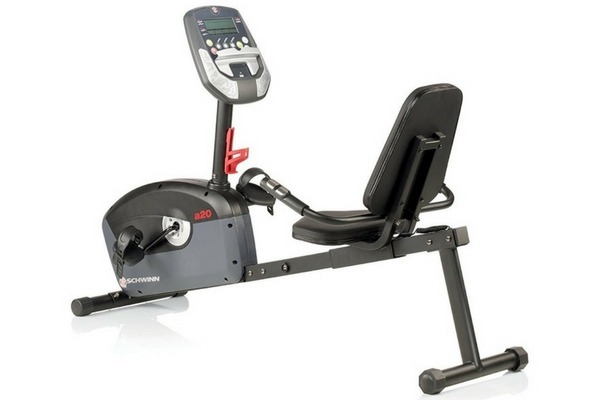 Schwinn A20 Recumbent Bike may be one of the outstanding options for you to consider. This Bike is currently among the best recumbent bikes available in the market. And it meets almost all of the criteria that people line out when they buy an exercise machine. To be honest, this bike is not as well equipped as other bikes in the same category, but we are going to tell you the reason why it is one of our recommendations to you. First off, it is a simple. You will find it super easy to assemble. It takes you less than an hour to spend for this 60-pound machine, quite light. However, despite the lightweight, it is still very sturdy. The assembly manual by Schwinn, as usual, is quite detailed, from step by step and it makes sure you will not be confused. All the accessories are well packed. Talking about the simplicity, it is not only simple in getting this little guy ready to use, it is also simple in features. With under $300, people usually look forward to something stuffed with new features and innovative techniques. However, that could cause distraction and to most of the users who are women, they might get confused. Schwinn A20, on the other hand, has enough features that a fitness person wants. 7 automatic preset workout programs, 8 levels of magnetic resistance, with a large LCD feedback screen that display your workout metrics, including current speed, resistance, time, distance, RPM, burned-calorie count, heart rate, and results. What else you need? About the screen, some users actually point out a drawback of this screen that it is hard to read in low light. Schwinn use battery-power and it is just for one-hour use per day or so, and unfortunately, the batteries included in the package are not rechargeable. Another critic toward this screen is that it is not modern. It is basic black and green digital, which makes it look lackluster. And while other brands equip their machines with colored and even touchscreen, Schwinn make it absolutely basic. Maybe it is an intentionally modest way to confirm their quality? Oh, and you know what, there is a built-in speaker. What is the speaker for? No one does exercise in silence, right? Inspirational tunes are something people who do fitness definitely need to boost their pace, to summon the energy. The speaker is there for that, and it is stereo. Not to mention the quality this would not be appropriate because we are looking at a fitness machine, not a music player. The speaker can be compatible with nearly every device out there: iPod, iPhone, Walkman, even tablet. Yes, it comes with a 3.5-millimeter stereo jack plug. This is standard. One of the outstanding things that we notice about the Schwinn A20 recumbent bike 2013 is that users who have back problems or joint pain are very happy with the seat. It is padded, and it can slide back and forth. The seat back is stiff and the angle supports the exerciser’s backbone so that it is not too reclined and not too straight up-and-down, their bodies are not strained. That is really like a salvation to them. However, there is one minus. If you are tall, more than 6 feet, you might need to choose another machine. Then we look at the operation. A20 fitness has a magnetic system. As a result, its operation is completely quiet, which means you can do exercises whenever you want, even in late nights, beside your kid’s bed. Alternatively, maybe, you want to watch television during the workout. The exercise will be horrible if the machine produces noisy sound. And remember the speaker that we praised above? Its mission would fail if the machine does not shut its mouth for the music during your exercise. A very disappointing thing about Schwinn A20 recumbent is the power issue which we roughly talked about in the LCD screen part. The console needs four D-cell batteries to operate. It does not come with an AC adapter that you may have to buy separately if you do not want to spend monthly expenditure for batteries. One more minus is that there is no memory to keep track your workout intensity. You cannot monitor your statistics day by day. Unless you note down metrics with pen and paper every day. Computerization is a very great feature of our time when we have every figure tracked by the system and they automatically calculate our overall and average performance. However, with the price that Schwinn A20 manual is offering, we think this is acceptable. Not all machines in the same price range provide such tracking system. To wrap it up, Schwinn A20 is incredibly easy to use and magically comfortable, especially to those who have physical problems with their back. According to our Schwinn A20 recumbent bike reviews, there is one thing to bear in your mind before you decide to buy this. This machine is not for commercial use. It is not the one that people put in gymnasiums for many people to use. It is for your home, it is to be there for your personal use. Along with different fitness options, many people nowadays choose to workout at home. Then, Schwinn 250 recumbent bike, with the improvement from Schwinn 240 Recumbent Exercise Bike brings many benefits to users. To begin, Schwinn 250 comes with a variety of resistance levels and preset programs. For example, you could enjoy multi-functional features of 17 preset programs (including profile and heart rate controlled programs) in a quick way. It creates motivation by equipping the best fitness goals to you. You will be challenged by 16 levels of resistance, which contribute to joint and back reduction. Another point worth mentioning is the design of the console. Besides a large LCD screen, Schwinn recumbent bike 250 also features speakers and MP3 input; two-speed fan; water bottle holder and utility tray. These Schwinn 270 recumbent bike parts boost the convenience and comfort for users when using this type of exercise bike. You don’t have to worry about your battery draining why spending much time listening to music. 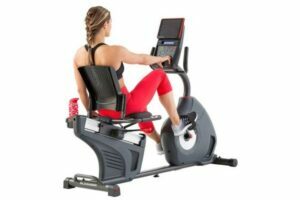 About the comfort, Schwinn 250 recumbent exercise bike satisfies the usage in a long time with a thickly padded seat with side bolsters and lumbar support. Thus, whereas you are reading a book, watching TV, etc…, your hands are free and your body is relaxing in the comfortable seat. 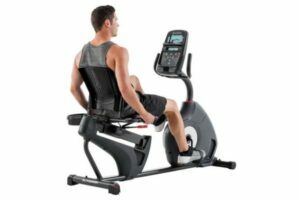 Our Schwinn 250 recumbent bike reviews clarify that this type of machine is specially designed for anyone who wants reasonably priced and well-performing equipment. Schwinn 250 recumbent exercise cycle brings many benefits to users which become very effective in losing weight as well as burning calories. Therefore, using this smart tool means that you have a chance to challenge yourself with various options. It worths buying and there is little chance that you will be unhappy with the Schwinn 250 Recumbent Exercise Bike.